The Leopards have risen to No. 7 in 4A DII after being picked to finish fourth in their district, and in a wide open year in that division, the sky's the limit. Lorena battled several key injuries throughout last year en route to a 5-7 finish and the team’s first losing season since 2014. But with the tradition Ray Biles and the Leopards’ coaching staff have built over the years, there was no question it wouldn’t be long before the program was back in contention for a district title. Biles said one of the silver linings of last year’s injuries was getting a host of young players who may not have been ready for the varsity level some valuable experience. Those same players are now a key reason why Lorena is 8-1 with a chance to claim its seventh district title in the last 10 years. “Our kids understand it’s not just about ‘me’ and it’s not just about right now – it’s about us,” Biles said. “It’s not about getting a flash in the pan. Anyone can win district one year. When you start winning three out of four or four out of five, you’re starting to build a tradition where that’s expected. The Leopards have played one of the toughest schedules in Class 4A Division II this year but have still managed to stand atop the loaded District 8-4A DII standings. 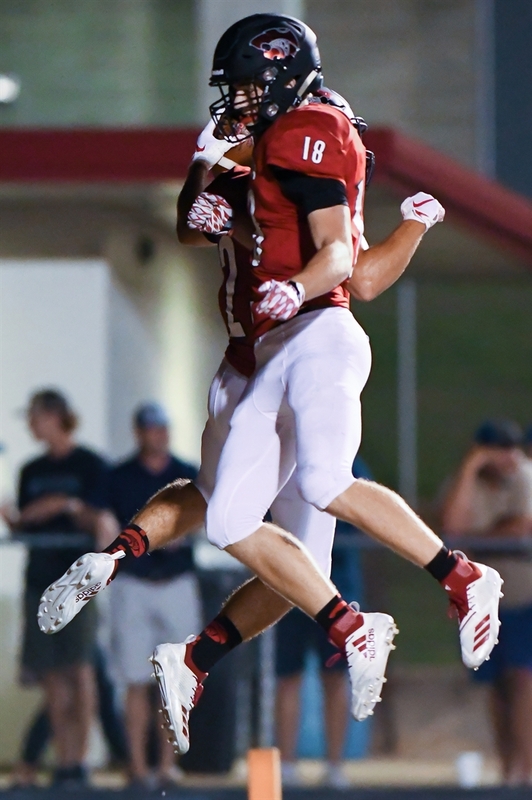 Lorena defeated China Spring, Franklin, Lampasas and Teague to open the year before cruising past Fairfield 41-13 in the district opener. The second game of district play was the only slip up of the season for the Leopards, as the team turned the ball over an uncharacteristic four times in a 31-28 loss to Waco Connally. 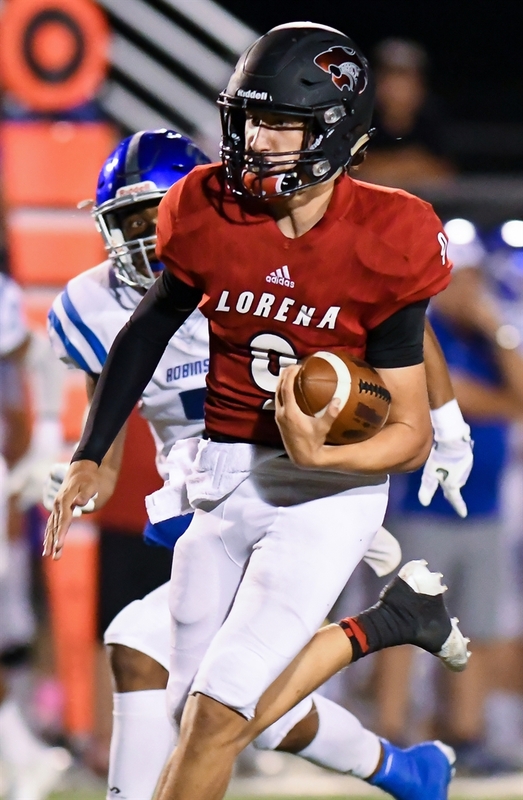 The Lorena offense, which is averaging 36 points per game, is led by junior quarterback Bradley Lina, who has thrown for 1,854 yards and 19 touchdowns and has rushed for 461 yards and eight TDs. Lina filled in at the varsity level as a sophomore last year when injuries took out the team’s starting quarterback, and he wound up throwing for 1,400 yards and 11 TDs. AJ Bell is the team’s leading rusher with 770 yards and 11 TDs on 112 carries while Ben Craig and Ty Moore are the leaders at wide receiver. Craig has 29 catches for 655 yards and seven TDs and Moore has caught 28 passes for 548 yards and six TDs. On the other side of the ball, the senior trio of Daylon Bartosh, Cade Michna and Greg Martinez have paced a defense that’s giving up 17 points per game. Bartosh has 150 tackles and 12 TFL, Michna has 130 tackles and three INTs, and Martinez has 98 tackles, 20 TFL and 7.5 sacks. “We’ve really done a good job of preventing the explosive plays of 20 yards or more,” Biles said. “If we can force someone to snap the ball over and over, there is a greater chance for a penalty or a turnover. If they go 80 in one play, the only thing we can do is get the kickoff return team out there. Lorena has hit on several home runs since the loss to Connally, bouncing back with wins over Robinson, Salado and Madisonville to set the team up with a chance to clinch the outright district championship at 7:30 p.m. Friday night against Mexia. While the Black Cats are 2-7 and 0-5 in district play, they lost to Robinson in overtime, lost to Connally by just a point and fell in a close game to Madisonville. Biles said the Leopards know Mexia isn’t a typical bottom-of-the-standings team and are focused on ending the regular season on the right note.